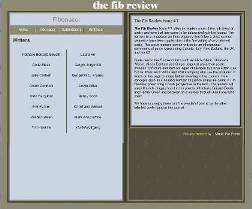 Since its first publication three years ago, The Fib Review has experienced many changes. 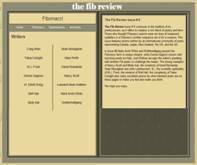 Each of the previous issues had different looks, different editors and different webmasters. 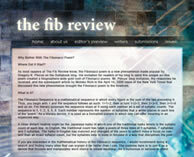 What has been consistent throughout the five issues is the quality of the Fibonacci poems crafted by talented poets. 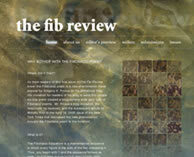 From its inception as an experimental on-line journal, the Fib Review has sought out poets of Fibonacci poetry whose diverse styles and penchant for experimental poetry have made the Fib Review a unique poetry journal ... and that will never change.